The VL53L0X laser range finder is a high-precision distance sensor that based on new Time-of-Flight (ToF) principle. VL53L0X provides accurate distance measurement whatever the target reflection unlike traditional technology. It can measure absolute distances up to 2m. 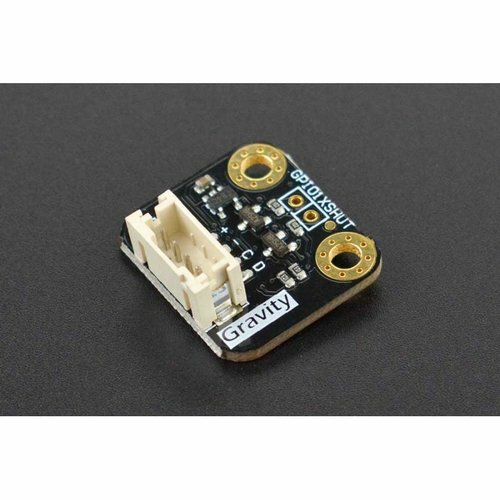 DFRobot has introduced VL53L0X into Gravity Series. It provides Gravity-I2C interface, plug and play, supports 3.3V~5V power supply, and is compatible with more microcontrollers, and adapt to more application scenarios than others. The VL53L0X integrates a leading-edge SPAD array (Single Photon Avalanche Diodes) and embeds ST’s second generation FlightSenseTM patented technology. Its accuracy is ±3%, response time is less than 30ms, power consumption is only 20mW in normal operation mode, stand-by power consumption is 5uA. The VL53L0X&apos;s 940nm VCSEL emitter (vertical cavity surface emitting laser) is totally invisible to the human eye, coupled with internal physical infrared filters, it enables longer ranging distance, higher immunity to ambient light and better robustness to cover-glass optical cross-talk.